In September, President Trump and Republican congressional leaders together released their tax cut framework. Despite widespread criticism that the framework heavily favored wealthy Americans and lacked key details, last week House Republicans released proposed tax legislation that is largely aligned with this framework. 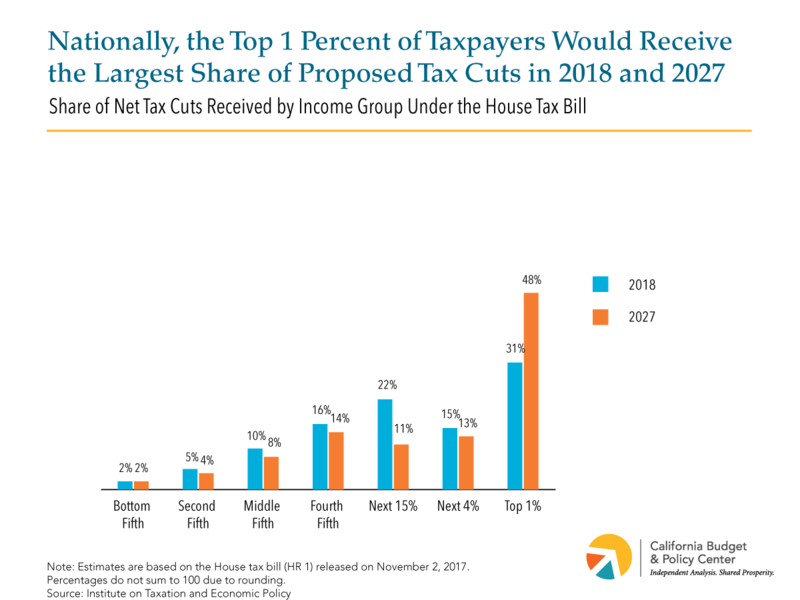 In our post last Friday, the Budget Center noted that in spite of making some superficial changes to the previously released tax plan, the House tax bill is a fundamentally flawed proposal that would provide little or no benefit to low- and middle-income households while giving huge tax breaks to the wealthy and to large corporations. What’s more, this proposal would significantly increase the federal deficit, leading to budget cuts to many public services and systems that help low- and middle-income families and individuals to make ends meet. Small changes from the earlier tax framework don’t fix a deeper problem. Like the original GOP tax framework, the tax bill offers outsize gains to higher-income Americans because despite provisions meant to make it seem less weighted to the top — like retaining the 39.6 percent top rate for the personal income tax — the House tax bill maintains core GOP tax framework components that primarily benefit the richest taxpayers. For example, cutting corporate tax rates, instituting a lower tax rate for pass-through businesses, and phasing out the estate tax are all proposals that mostly or entirely benefit the wealthy. Overall, more than three-fifths of the income that millionaires receive would not be subject to the 39.6 percent top rate. The House bill would deal a heavy blow to Californians. 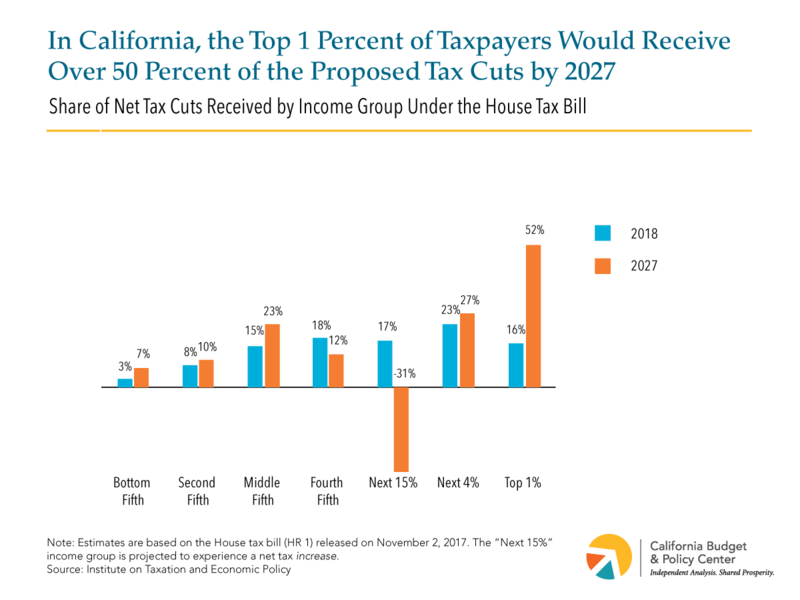 In California, the House plan’s distribution of tax benefits remains particularly unfair, with low- and middle-income Californians receiving minimal tax cuts relative to the wealthiest (see chart below). By 2027, the top 1 percent alone would capture over half of net tax cuts. Moreover, because of proposals like the scaling back of the state and local tax deduction (SALT), this bill would actually raise taxes for many middle-income households. Many middle-income households in California would also be hard hit by the House tax bill’s proposal to cut in half — from $1 million to $500,000, for future purchases — the amount of mortgage debt eligible for the mortgage interest deduction (MID). This would lead to higher taxes for many California households purchasing a home and create a disincentive to moving, thereby exacerbating California’s housing affordability crisis. Additionally, the bill would cost at least $1.5 trillion over the next decade. This increase in the federal deficit would very likely lead to budget cuts to critical federal programs like SNAP and Medicaid (CalFresh and Medi-Cal in California), which millions of low-income Californians count on to make ends meet. (See our post on the recently passed congressional budget resolution for more on the threat of cuts.) For many low- and middle-income households, any tax benefits from the House bill would be dwarfed by the loss of support in resources to help cover their family budgets. Reduced federal funding for public services would also place a greater burden on the state budget, likely forcing state officials to cut benefits for struggling communities. With House leaders planning to bring their tax bill to a vote before Thanksgiving, Californians must pay close attention to our congressional representatives’ actions in the coming days and weeks. Our state cannot afford a costly tax giveaway to the wealthiest households and corporations at the expense of low- and middle-income families.